Lou D’Allesandro has faced a wide variety of circumstances during a colorful lifetime. His story is noteworthy, especially for a country in which leadership is more important than ever. 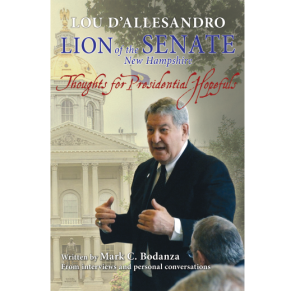 From the challenges and opportunities of youth, and through the vagaries of politics and higher education experienced in later years, Lou D’Allesandro has faced a wide variety of circumstances during a colorful lifetime. Mix in his role as power broker in the Nation’s first Presidential Primary and you have a story with little to compare. There may have been little to predict the trajectory of Lou’s life in politics from his youthful school days, but the whole of the New Hampshire State Senator’s life has been one filled with surprise and the unexpected. Lou’s story is a compelling one. It demonstrates that all things are possible and even more importantly the value of genuine relationships based on trust and service. Lou’s political acumen is an example of hard work and not of advanced polls or fancy metrics – something earned, one conversation, one handshake at a time. His story is noteworthy, especially for a country in which leadership is more important than ever. Lou, is quite a gentleman!